Added on April 26, 2014 by Meredith S. K. Boas. CONSIDER OUR FACES BLOWN TOTALLY OFF! Actually, that sounds kind of gross. Don't think about that. Think of us instead screaming and yelling and texting excitedly back and forth because that's a way more accurate description of what we did when we received a very, very generous late night donation from an anonymous donor! Thanks to them and all of our contributors we are now 55% of the way to our goal with 48 days remaining! 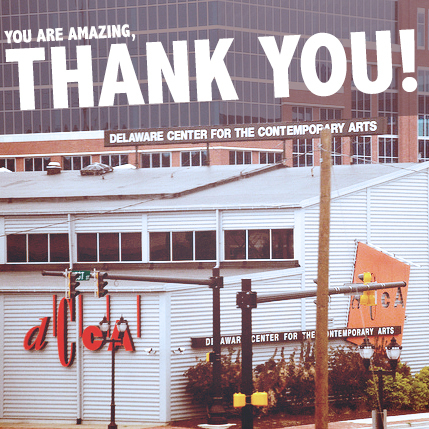 Most importantly, this has helped us to pay 100% for the space (DCCA) this year and 100% of website related fees! That is TWO things that are now paid for because of the kindness of our amazing community! Hanging & display supplies - tables, additional hanging spots, plus nails, hooks, tacks, tape, that weird blue sticky stuff, etc. Paint and repair materials - to undo the damage from all of the above. A/V supplies - supplies for performance artists that we cannot source on our own for free. Event supplies - signage, lighting (this alone cost us over $300 in 2013), extension cords, decor, activities, misc. requirements. Food & beverage - appetizers, drinks, adult beverages & related supplies for the event. Administration - largely made up of fees for event listings, marketing, printing, and fundraising (it costs money to raise money). Like all of our artists, supporters and volunteers, we are happy to donate our time and energy into making this event like nothing else in the area. We do not take a cut of any of the money we raise. Please, if you have not already done so, make a donation of any size to our campaign and help us continue to build Fun-A-Day into one of the best art events the state has to offer.